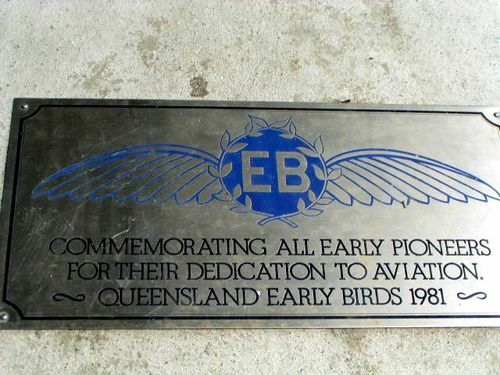 A plaque commemorates early aviation pioneers and was erected by the Queensland Branch of the Early Birds Association. A project was undertaken to erect a plaque and drinking fountain near the Southern Cross Memorial at Eagle Farm. This was unveiled by the Chairman, Tom Drury in March 1981. It was later transferred to the location of the new memorial building. After attending the annual get together of the Early Birds Association of Australia in Sydney in 1977, three Queensland members decided that it would be an excellent idea to form a Queensland Branch of the Association as it was impossible for some members to attend reunions etc in Sydney. a meeting of "interest" called at the Royal Queensland Aero Club on 16th February 1978. A very enthusiastic 49 persons attended the meeting which was Chaired by Arch Steinbeck OBE. President Harold Affleck flew up from Sydney to attend the meeting. A decision was made to form a branch and nominations were called for Chairman, Hon. Secretary/Treasurer and a committee of three. The Branch ceased to operate from 26 November 2010.